Having originally formed in California in 1964 and critically acclaimed as one of the most influential bands of the 1960s - originating Psychedelic, Raga and Country Rock - the Byrds underwent multiple changes in personnel, with Roger McGuinn remaining the sole consistent member. Country rock pioneer Gram Parsons had a brief stint in the band, but departed with Chris Hillman in late 1968. Between 1968 and 1973, McGuinn elected to rebuild the band, creating a new incarnation featuring guitarist Clarence White, Bassist Skip Battin and Drummer Gene Parsons - the longest standing configuration of the Byrds. 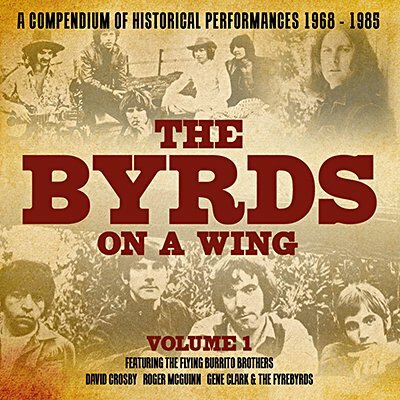 This eight-disc collection showcases the history of the Byrds, from their early peak and critical acclaim as one of the most influential bands of the 1960s, to several of the original members disbanding to have successful careers either as solo artists or in groups, such as CSNY and the Flying Burrito Brothers. The performances featured here were originally broadcast on US radio and are presented here with background notes and images. 2. My Back Pages - Baby What You Want Me To Do?